Thinking about the career of David Essex before writing this piece has led me to conclude that his attitude, approach to the business, singing style and career can be summed up in one simple phrase of just four words – “The boy done good”. In fact David comes across as so down to earth that it was only this morning that I wondered whether Essex was his real surname (it turns out it isn’t, he was born David Cook). David grew up spending his holidays working in funfairs while first British rock and roll and then the Merseybeat grabbed the music headlines. In the mid 60s he began his musical career, first by playing drums with the Everons and then by changing his name to Essex and becoming a singer. Despite recording a number of singles the charts proved too difficult to crack and the musical career was put on the back burner as acting beckoned. 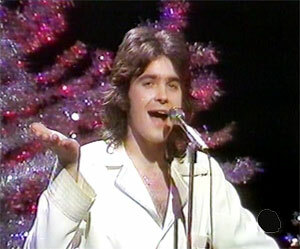 After honing his acting and singing techniques David Essex landed the role of Jesus in Godspell in 1971 and was rewarded with the award for “Most Promising Newcomer” by the Variety Club of Great Britain. This was followed by a starring role in “That’ll Be The Day”, a film that was to relaunch his singing career. The film co-starred Ringo Starr, Keith Moon and Billy Fury and, most importantly, featured a self-penned song “Rock On” by David. 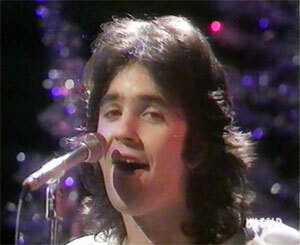 The success of the film coupled with the success of “Rock On” led to the emergence of David Essex the pop star, the heart throb. The success of “Rock On” was immediately consolidated with his first British tour (and his first experience of his rapidly expanding, extremely vocal fan base) and his follow-up single “Lamplight” making the Top Ten in November ’73. The stage was set for an interesting few years. While the highlight of 1974 was his first number one with “Gonna Make You A Star” he kept up with his acting and the follow-up to “That’ll Be The Day”, entitled “Stardust”, was released in 1975. 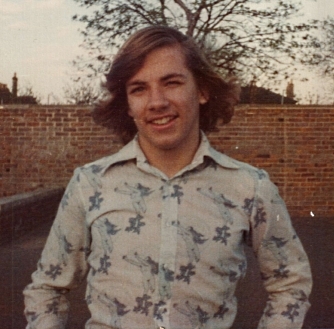 The success kept coming and 1975 saw David, whose poster by now most have been in every teenage girl’s room, have his second chart topper with “Hold Me Close”. This however was to be the highpoint of his career as a teen idol, with his fanbase aging and punk on the horizon his subsequent 70s singles weren’t to chart as high. The lack of chart success however didn’t effect David’s career as he returned to the theatre sucessfully starring as Che in the musical “Evita”. This musical also saw him return to the charts, albeit in a different musical style, reaching number 3 with “Oh, What a Circus” in 1978. He was also at this time involved with Jeff Wayne’s musical interpretation of “The War of the Worlds” starring as “The Artillaryman”. David then returned to film, scoring the music for, and starring in, “Silver Dream Racer”. Based around one of David’s passions – motorbikes – this film also led to his first hit of the 80s with “Silver Dream Machine”. While this was followed in 1982 with the Christmas hit “A Winter’s Tale” David’s time in the charts was really at an end. With a career that continues to include theatre, televisions and occasional recordings David Essex is still making a success of himself. A lifetime away from the funfairs of his youth I can only repeat my opening comment – “The boy done good”.